Before The Hennepin Theatre District, There Was? Victorian trade cards are are like doors of curiosity we should open in order to explore our history. One never knows what historical treasure might be unearthed. The trade card collector might find out about his or her relatives’ buying habits thru scrapbooks, or what businesses shaped their home town. Who knows? I acquired two Victorian trade cards where the business address was Hennepin Avenue in Minneapolis, MN (a major entertainment thoroughfare about 1 hour from where I grew up). This definitely sparked my interest. I found out during my search for info on Ed. J. Ball Business Signs that prior to Hennepin Avenue in Minneapolis, MN being known as the theatre district, it was known as the primary office district due in part to the construction of the Lumber Exchange in 1885. I also found out a little about Ed. J. Ball’s neighbor at 258 Hennepin Avenue. In 1885, Thorpe Bros. (realtors) opened their doors at that location. One of the founders, Samuel Skidmore Thorpe, became a major influence in real estate circles both locally and nationally. As for Ed. J. 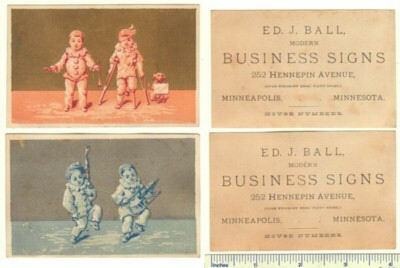 Ball Business Signs, I never did find out anything (at least not yet) other than it existed at 252 Hennepin Avenue sometime prior to 1880 or after 1899. That’s OK. I did unearth a little more about the area near where I grew up. ** If you liked this blog post, click on the bookmark button to the lower right.